The 32 inch size is very competitive, especially in the budget category. The Toshiba 32L1350 holds its ground in the design department with a rounded streamlined look, but is about as basic as it gets when it comes to features. There are no advanced picture quality features, smart TV options, or 3D playback. Some of the other budget TVs that it's competing against are Sony's KDL-32R400A, Panasonic's TC-L32B6, and Samsung's UN32F4000. The 32L1350 will be available in March 2013. Picture quality on the Toshiba 32L1350 is not necessarily top notch, but it's not so bad for a budget television. All of the mid to top tier picture quality features have been dropped to attain the budget value. You end up with a TV that will perform well in the office, guest room, or kid's room. In other words, you aren't going to find a TV suited for the home theater in this one. We found that the picture quality largely depends on the source material here. Standard definition signals are the worst offenders due to the lack up upscaling technologies in the TV. Color accuracy is another area of concern. Colors may appear bright, but the level of realistic reproduction can't compare with the mid to top level TVs. 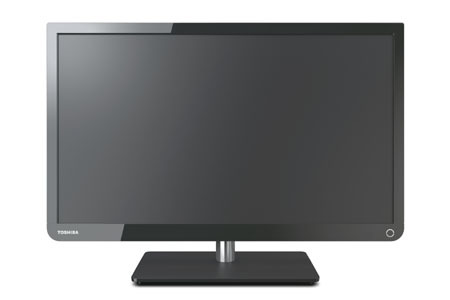 The 32L1350 has a black plastic frame and stand instead of gun metal like other TVs in Toshiba's lineup for the year. The frame has square edges on the top and rounded edges on the bottom for a streamlined appearance. The stand is a black plastic square with rounded edges and the arm holding the screen up is round and silver. It's a good look for a budget television.